So, this is probably going to be the subtitle of many Talk About It Tuesdays: Currently Obsessed. I am a fangirl, I just can't help it. I have great love for many different things and most of them are geeky. 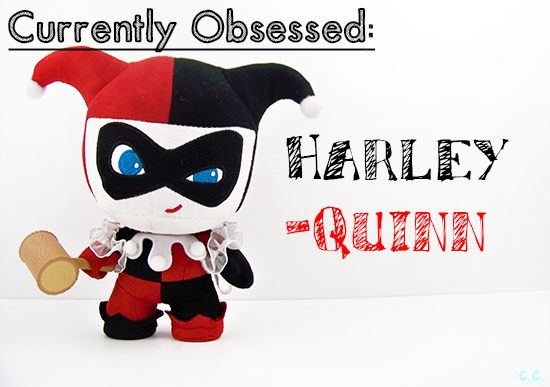 Right now I'm currently obsessed with Harley Quinn. This isn't really a new obsession, since I mostly cycle though my obsessions. Being really into something for a bit until I move on to something else, repeat with X number of awesome things. 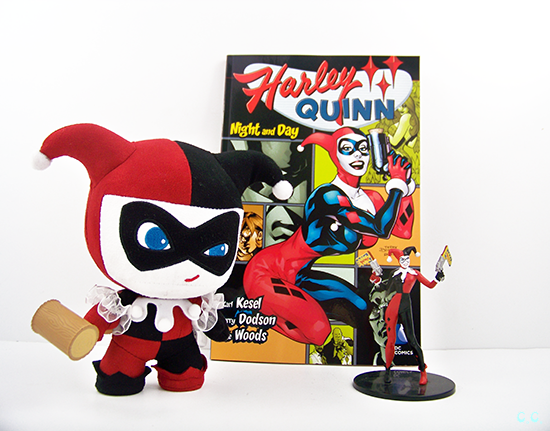 If you want to read about my mad love for the clown queen of crime, click below! 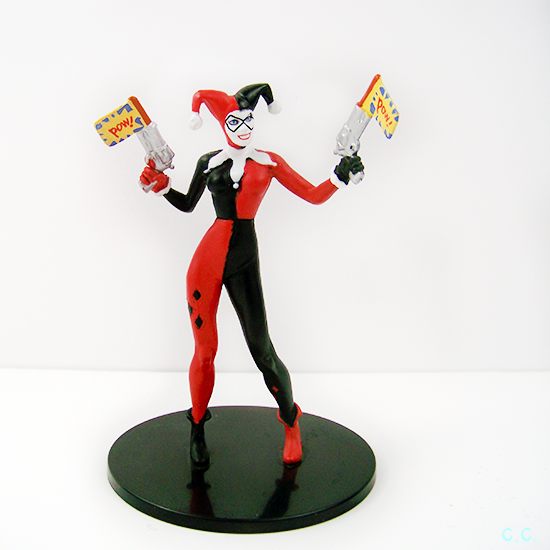 Harley was a favorite character of mine growing up, watching her on Batman the animated series. She wasn't a huge character, but she had such great personality. 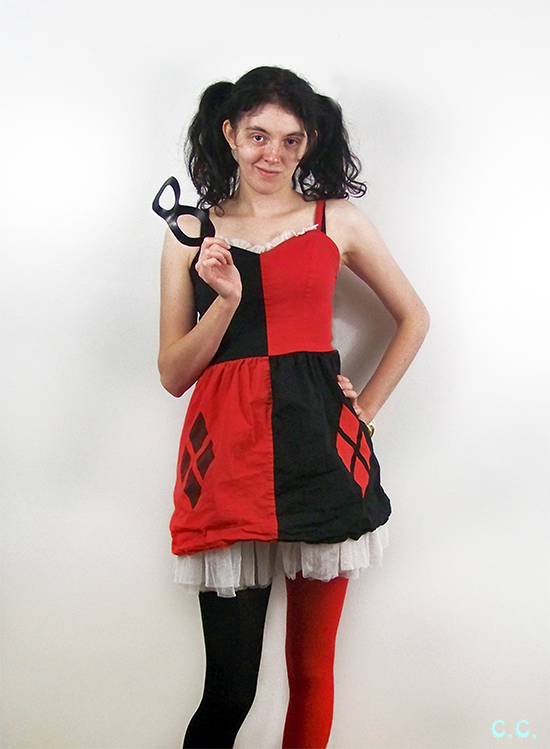 Plus her costume and powers of being extremely flippy, puns, and gag-weapons appealed to me in a big way. 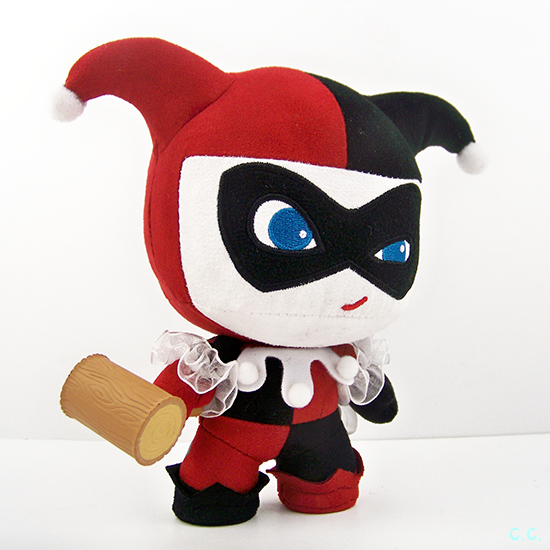 For those of you who don't know, Harley Quinn is the Joker's girlfriend. 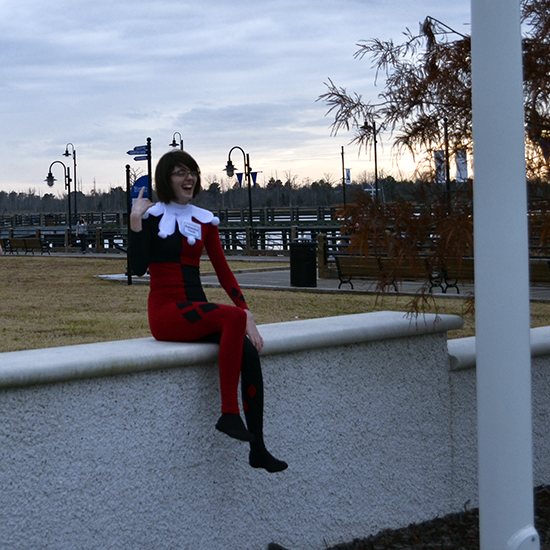 Harley Quinn was my first ever cosplay, the actual costume is still unfinished, but here is a candid shot from the con I wore it to. 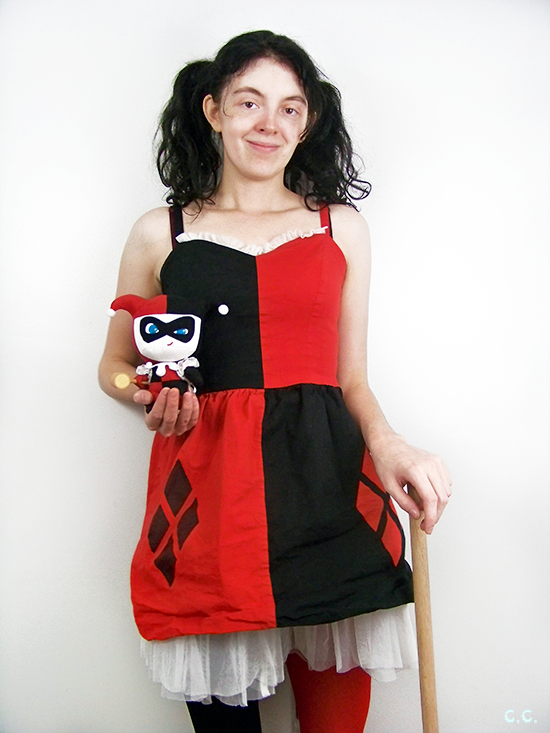 I made everything from scratch, and will make the rest of the accessories from scratch eventually too! 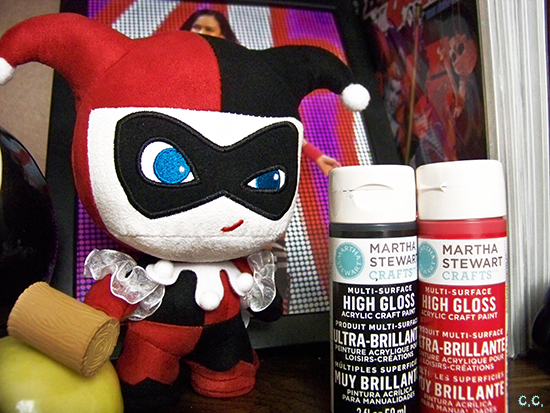 This Halloween, since my original Harley Quinn costume still isn't done *sigh* and Marbles spilled coffee on my W.I.P. Louise Belcher costume, I was a more casual Quinn. I got to dress up for work and a Halloween party I had. It was pretty fun, as an alternative! 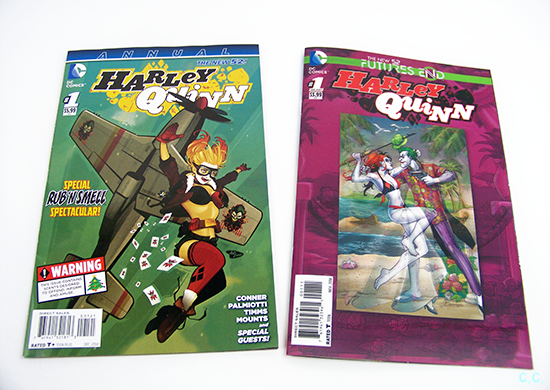 I even got the 3D-covered one-shot and the first ever scratch and sniff comic! 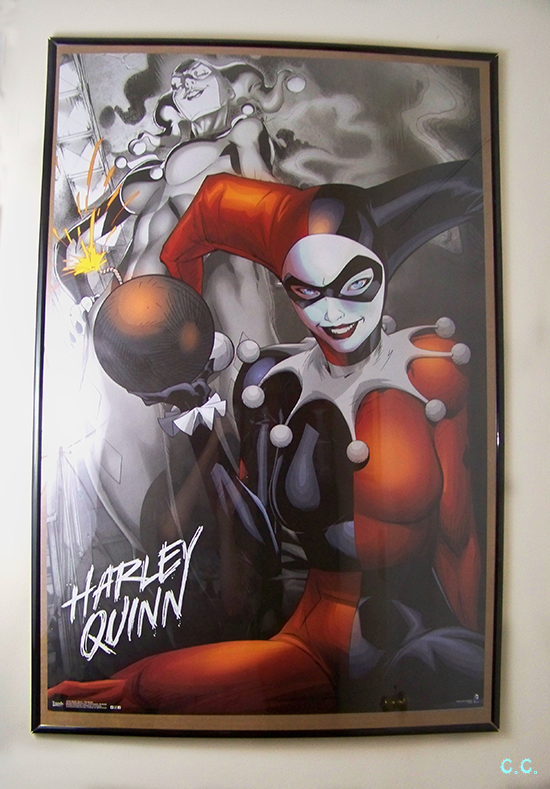 This poster is "da bomb"! 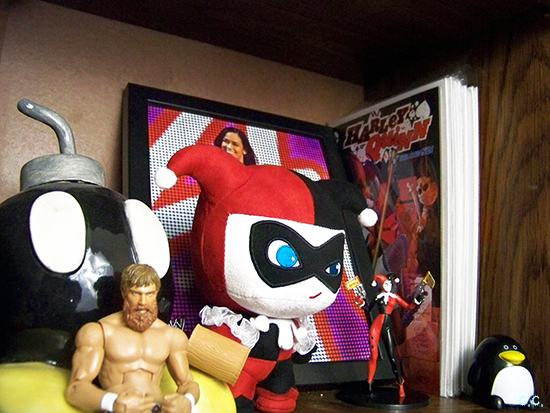 This is my shelf of awesome stuff that's connected to my computer desk. It's a little cubby of happiness basically. 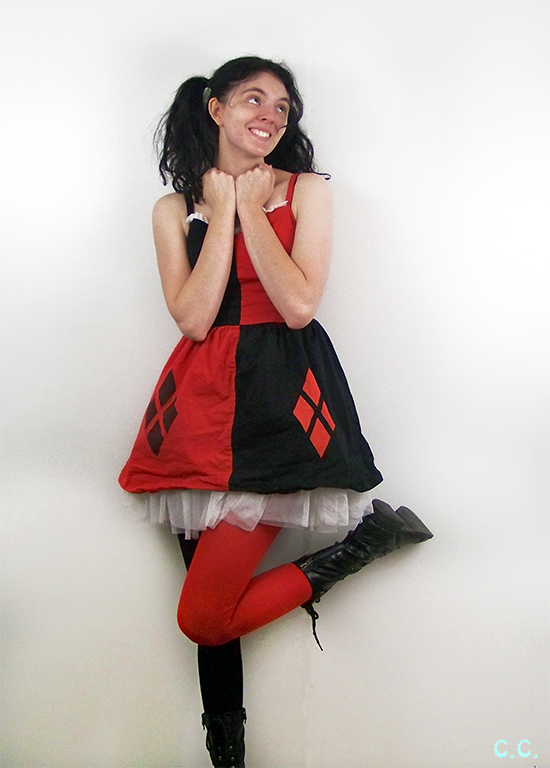 This is my excited face because of all the pure Harley Quinn joy I am experiencing. Oh, and the hope that her role in the upcoming Suicide Squad movie is a good one and that the actress that they announced to play her yesterday will be good. Sneak peek alert! I'm in the planning stage for what I hope will be an awesome HQ project. It's a little ambitious, but I think it will work out, stay tuned! 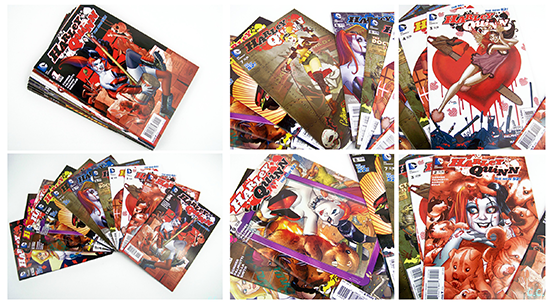 Who is your favorite super hero/villain/comic character/book character?